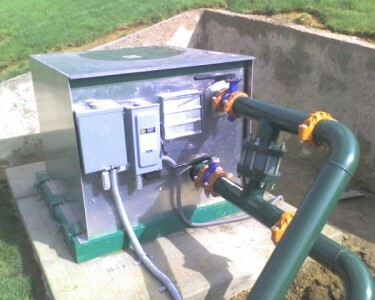 The RSC series of pumping systems were designed to provide the residential/commercial turf market with a simplistic cost effective solution to your pumping needs. The standard lockable enclosure provides security when the pumping system is to be exposed to public settings. A microprocessor controller device combined with pressure and flow sensing switches provide the user with an easily adjustable pumping station. Flooded suction systems come standard with an inlet isolation valve and thermal pump protection. Lift systems come with a prime sustaining feature, and a heavy duty foot valve. Each system is fully tested prior to delivery and comes backed by a one year manufacturers warranty. Whether it is a top of the line variable speed drive unit or the tried and true conventional series unit, we guarantee that each unit is built, programmed, and tested to meet the requirements of the Nursery and Landscaping industry. If you need to control, move, meter or monitor water efficiently and reliably, call PMC for any of your pumping station needs.